[Daily Cheonj] National Missionary Council of the Elders of Shicheonji Church of Jesus, “Christian Council of Korea(CCK) Must Repent and Disband!" National Missionary Council of the Elders is the group of people who had belonged to CCK before they were placed in Shincheonji Church of Jesus. 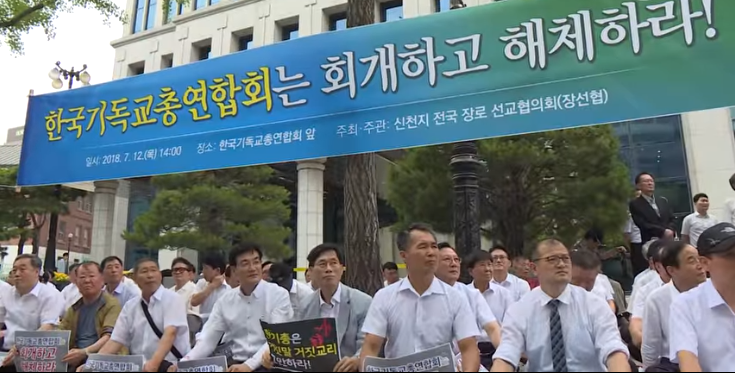 On the afternoon of July 12th National Missionary Council of the Elders held a press conference demanding the dissolution of CCK which accuse Shincheonji Church of Jesus as an anti-national and anti-social organization. “Do you think that we came to Shincheonji Church because we have no sense of perception and judgment? The reason why I have to admit Shincheonji Church is that Shincheonji Church is the Kingdom of God that has fulfilled according to the Bible and is teaching as the Bible says. Shincheonji Church has been teaching and testifying the reality of the fulfillment according to the Bible reasonably and logically based on the 5Ws and 1H. Shincheonji Church has suffered a great deal of damage so far because of the misunderstanding and prejudice of some reporters. We earnestly ask all of journalists who are attending here to let people know not about biased reporting but the truth about Shincheonji Church. Now CCK must repent and be born again. If CCK doesn’t do so, there is no reason why CCK exists and we will urge CCK to disband. And also National Missionary Council of the Elders denounced the immorality of some pastors who violate human rights and enforce coercive conversion program for monetary gain. (Rec: Yong-ho Guk, Secretary General of National Missionary Council of the Elders of Shincheonji Church of Jesus. There has been a steady stream of illegal activities such as embezzlement, fraud, sexual assault and unethical & immoral behaviors among the pastors belonging to CCK. And also there have been continuously unreligious behaviors such as a hereditary succession of a church by a pastor and an illegal election of a representative of a denomination. A pastor who has been sentenced to prison for his misconduct takes charge of the church and runs it again and there was the proclamation of conscience which CCK bought and sold the chairman position of the CCK with billions of money in the election. However instead of being punished for doing something illegal, CCK selected such a man again as its representative. Judging from these incidents, CCK can't purify itself at all. Along with this, National Missionary Council of the Elders urged the elders belonging in CCK to face up to the current reality of Christianity in Korea and play a pivotal role to purify and reform it as a fellow believers who believes in God. Victims who insisted that they were taken to coercive conversion by pastors who belong to CCK. They claimed that coercive conversion program that violate human dignity and disregard the freedom of religion must be stopped. “I have something I must say now to the sidesman who took me to coercive conversion education. Please stop coercive conversion education in Korea which ensures the freedom of religion. And if you put yourself right, let us have an open discussion with us. Even at this moment, coercive conversion committed illegally as a money-spinner is social evil that must be rooted out in Korea. I appeal sincerely on behalf of one thousand victims that money-making coercive conversion programs must be banned and pastors and sidesman committing these illegal behaviors must be punished. The citizens walking in and out of front of the building watched the press conference closely which called for self-examination of the religious world in Korea. 100 Doctrine-Comparison videos of Shincheonji Church of Jesus created great sensation among seminarians, general congregational members of churches and also towards the religious world in Korea. According to Shincheonji Church of Jesus, pastors of established churches started to control and protect their church by warning their congregational members to prohibit watching the videos and report it when it is given. However, ironically, Shincheonji Church of Jesus explained that such attitude of the pastors rather causes Shincheonji Church of Jesus to expand its congregation. National Missionary Council of the Elders declared that they will continue to reveal the truth of Shincheonji Church of Jesus to believers who misunderstand Shincheonji Church of Jesus, and to rally till the day that CCK disband itself.